August | 2017 | 50 Westerns From The 50s. 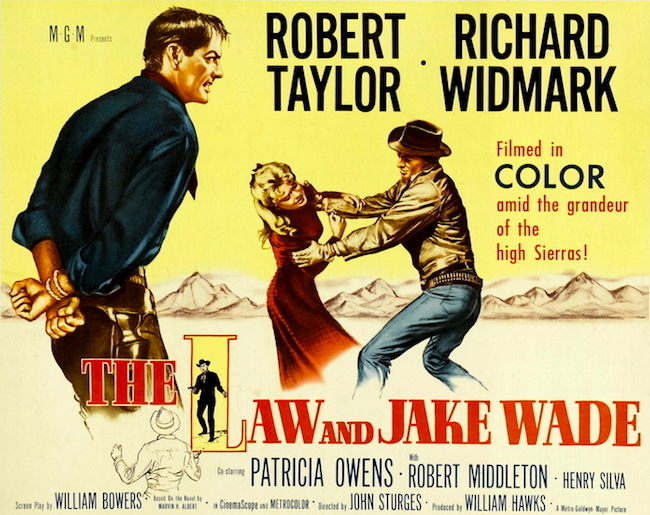 Blu-Ray Review: The Law And Jake Wade (1958). 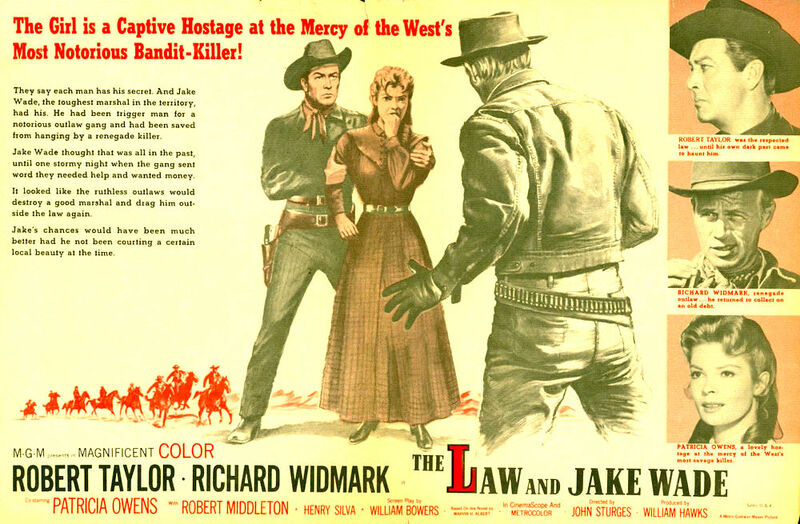 The Law And Jake Wade (1958) seems to be one of those Westerns everybody likes. The few times I’ve read or heard something negative about it, I always come way wondering if the dissenter had seen the same movie I saw. John Sturges was a master at building suspense over the span of about 90 minutes. And with Escape From Fort Bravo (1953), Jake Wade and Last Train From Gun Hill (1959), he did it within the 50s Westerns bracket. 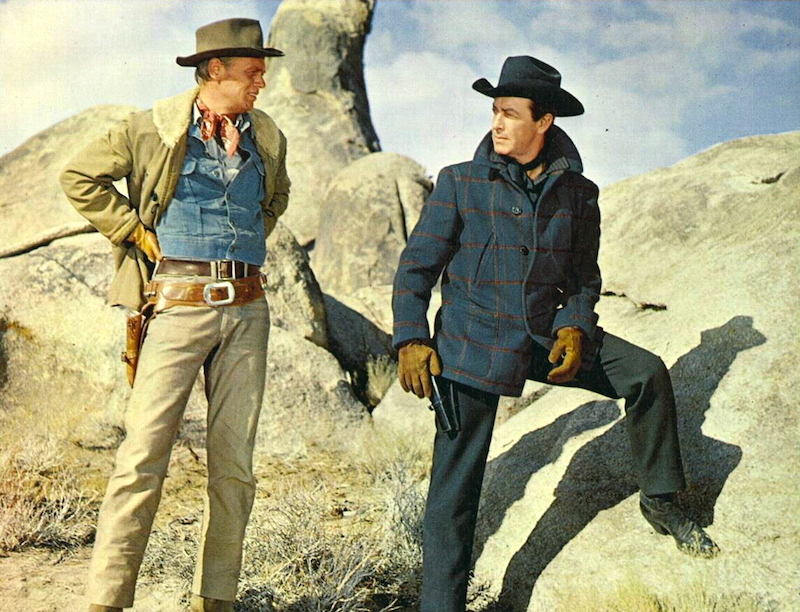 Jake Wade (Robert Taylor) wants to go straight and start a new life with his fiancé Peggy (Patricia Owens), but his old partner Clint Hollister (Richard Widmark) turns up — accompanied by psychopaths Henry Silva and DeForest Kelley — and wants to know where Wade buried the loot from an old bank job. Before long (probably still in the first reel; this thing moves fast), Widmark’s abducted Patricia Owens and they’re all headed into Comanche territory to dig up the money — with the Comanches on the warpath. This has the same “small group in a helluva fix as they go from Point A to Point B” setup you find in pictures like Roughshod (1949), Dragoon Wells Massacre (1957) and some of the Scott-Kennedy-Boetticher films. It’s perfect for Sturges, and he sets up the story and characters, then slowly turns up the heat as the movie progresses. While the ending may not be as satisfying as it could be, getting there is quite a ride. Robert Taylor stands as tall as you expect him to. He has to tow the line to keep his bride-to-be safe, and Sturges wrings a lot of tension from that. Widmark is terrific as Hollister — another one of his likable psychos. He creates a real sense of menace here. You know he has no qualms about killing his hostages, and figures that’s exactly what he’ll do once he’s got the money. DeForest Kelley and Henry Silva make quite an impression with their limited screen time. These are dangerous freaks, and we’re well aware of that just seconds after their first appearance. Robert Middleton also scores as the one somewhat human member of Wade’s old gang. There’s no composer credit for The Law And Jake Wade. It uses a lot of pre-existing stuff, much of it lifted from Elmer Bernstein’s score for Saddle The Wind. There was a musicians’ strike in ’58, and it affected quite a few films (Delmer Daves’ The Badlanders, for instance). Occasionally, something seems a bit out of place, but the music’s fine for the most part. Ferris Webster’s editing is top notch throughout. The Indian attack sequence is very well done. Warner Archive’s Blu-Ray is stunning. 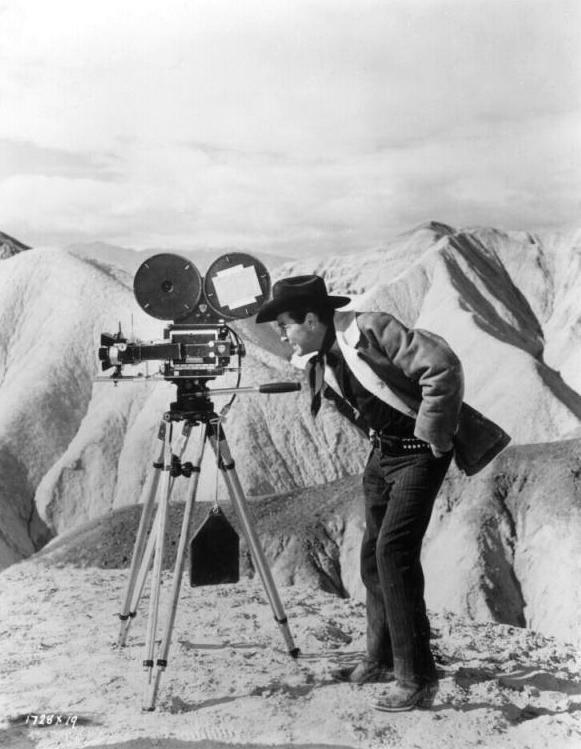 High-definition really brings out the detail and depth of Surtees’ Scope camerawork, making sure Lone Pine and Death Valley are a huge part of the picture’s overall effect. (Temperatures were right at zero when they shot the scenes in the High Sierras.) Sturges was always very good at emphasizing the isolation in his Westerns, and this Blu-Ray brings that front and center. The color’s good for Metrocolor and the sound is nice and clean. The only extra is an original trailer. The Law And Jake Wade is one of the essential 50s Westerns, and this hi-def edition of it was obviously given the care it deserves. 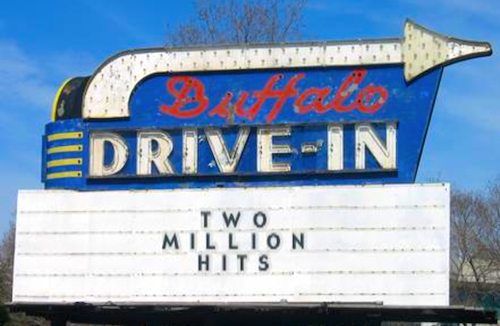 Here’s To Two Million Hits — And To You. 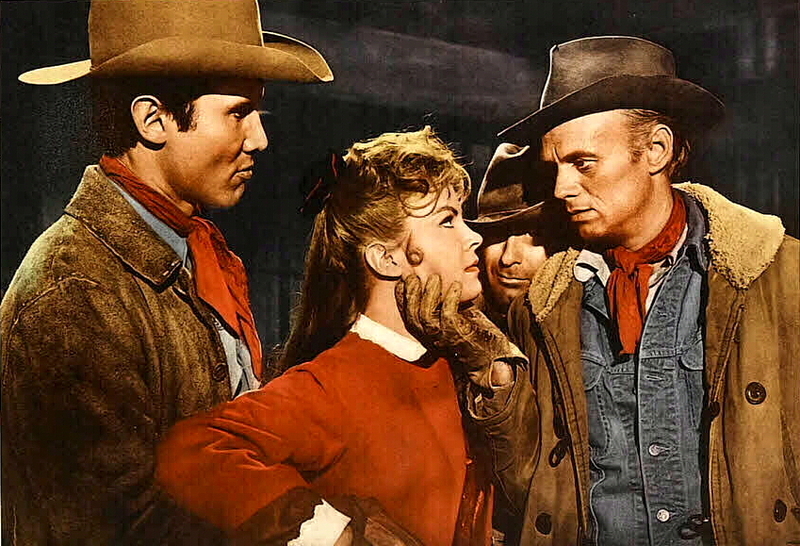 This morning, 50s Westerns From The 50s got its two millionth view. A big fat thanks to all of you who mosey through this place. In a film filled with one incredible image after another, this is one of my favorites. So when I realized this was Vera Miles’ birthday, there was nothing else that would do. 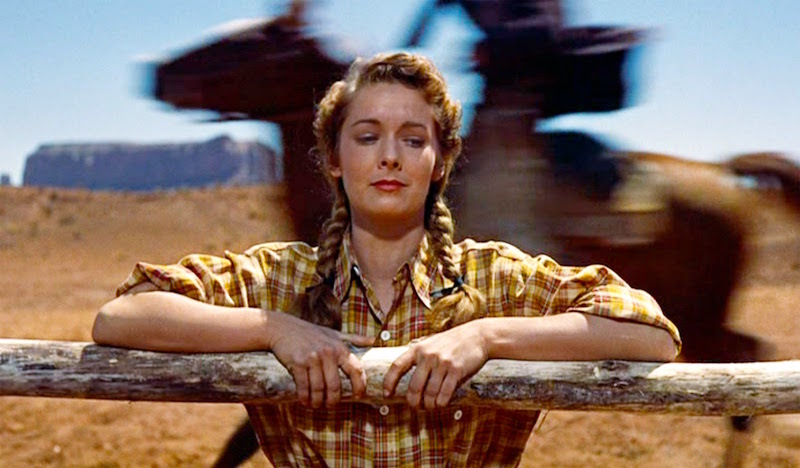 Of course that’s a frame from John Ford’s The Searchers (1956). Ford can somehow say more in a single frame than others can get in an entire feature. The great Maureen O’Hara was born 97 years ago today. 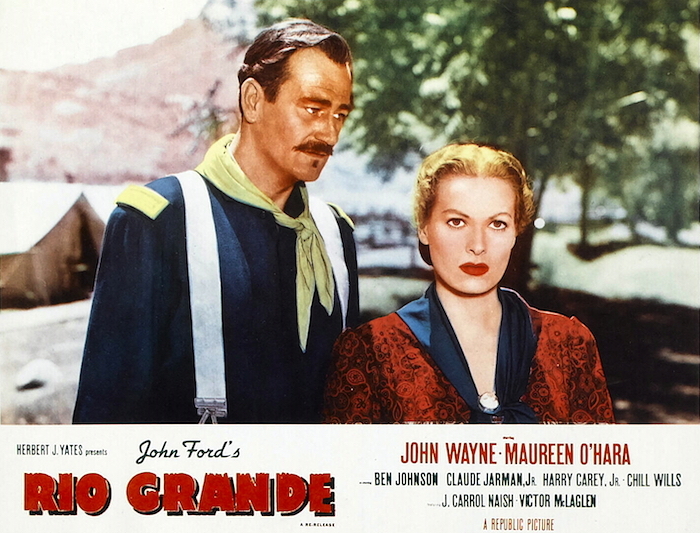 Here she is with John Wayne in John Ford’s Rio Grande (1950). They made it largely to get the chance to make The Quiet Man (1952), but they knocked out a masterpiece anyway. It doesn’t get near the recognition it deserves. Blu-Ray News #246: The Law And Jake Wade (1958). 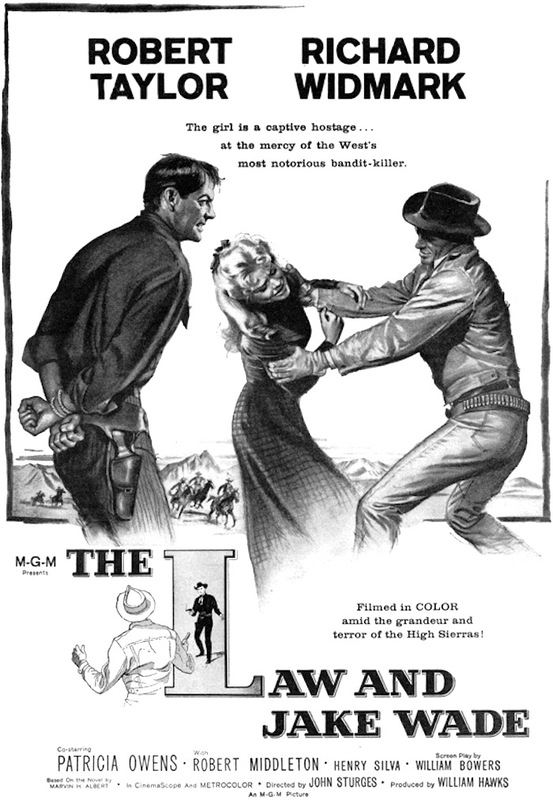 The Law And Jake Wade (1958) is one of the best Westerns of the 50s. It’s tight, tense and in CinemaScope, which is exactly what you want in a John Sturges movie. Oh, and it’s coming to Blu-Ray from Warner Archive. Jake Wade (Robert Taylor) wants to go straight, but his old partner Richard Widmark wants to know where he buried the loot from an old bank job. Before long, Widmark’s abducted Taylor’s fiancé (Patricia Owens) and they’re all headed into Comanche territory — and the Comanches are on the warpath. This is as good as it gets, folks — and I’m sure Warner Archive will treat it right. Essential stuff. Rory Calhoun would be 95 today. His run of 50s Westerns stands up to about anybody’s. Red Sundown (1956) really knocked me out, but others are just as good — The Silver Whip (1953), Dawn At Socorro (1954), The Hired Gun (1957) and on it goes. He worked with Ray Nazarro a lot, especially when he developed his own films, which guarantees you a pretty solid 80 minutes. 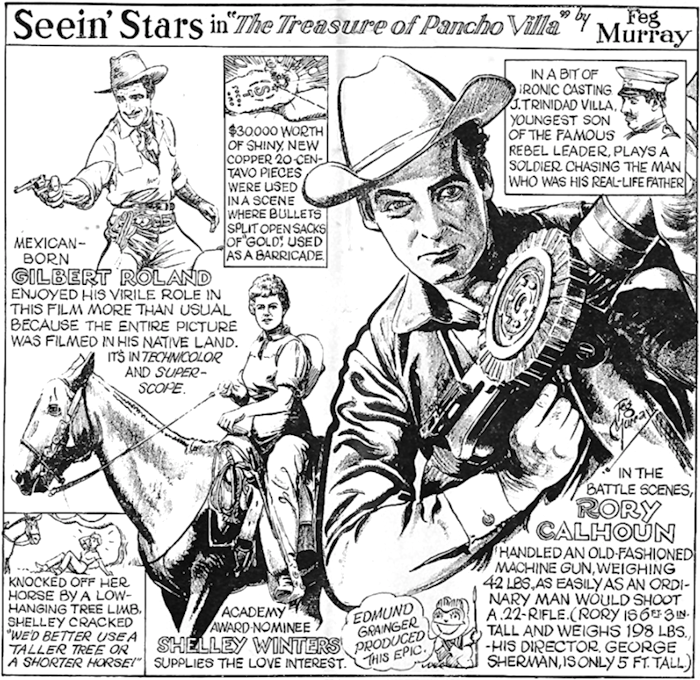 This newspaper piece plugs The Treasure Of Pancho Villa (1955) from George Sherman. Wish Warner Archive or somebody would get around to that one.